Pack on muscle with these time-tested ingredients. Farro has a similar texutre to that of quinoa, and it's super easy to cook. All you really need is a little extra virgin olive oil, sea salt, and herbs, and it's a healthy carb swap. Fun fact: Ancient Roman armies used to eat farro to sustain their energy, which means it could be great as a pre-workout meal. It’s also high in fiber, magnesium, and vitamins and it’s easy to digest. Unlike rice, it doesn’t become gummy, and it makes dishes creamier and thicker. Cooked farro can be stored in the refrigerator for up to five days or in the freezer for up to two months. Chef Irvine has whipped up a great vegetarian muscle-building recipe: farro and roasted eggplant. Cut eggplant in half lengthwise; trim off the rounded back so the eggplant can sit flat on a plate. Drizzle lightly with olive oil (about 1⁄2 tbsp) and season with salt and pepper. Place in a sauté pan over medium heat and grill on each side, 2–3 minutes. Place on a sheet pan and finish in oven for 15–20 minutes until tender. Place farro in a saucepan, and toast for one minute over medium-high heat. Add garlic, bay leaf, and vegetable stock and bring to a simmer. Turn heat down to low-medium; allow to cook for 25–30 minutes until tender. Strain any excess liquid; set aside. In a separate pan over medium-high heat, add 2 tbsp olive oil, onion, yellow and red peppers. Sauté until onions are translucent; add asparagus and farro. Deglaze pan with vegetable stock and continue to cook for two minutes to allow farro to absorb liquid. Finish with chopped parsley and set aside. Pour balsamic vinegar into a small pot. Heat until it is reduced by two thirds. Take off heat and stir in honey. Let cool to room temperature. 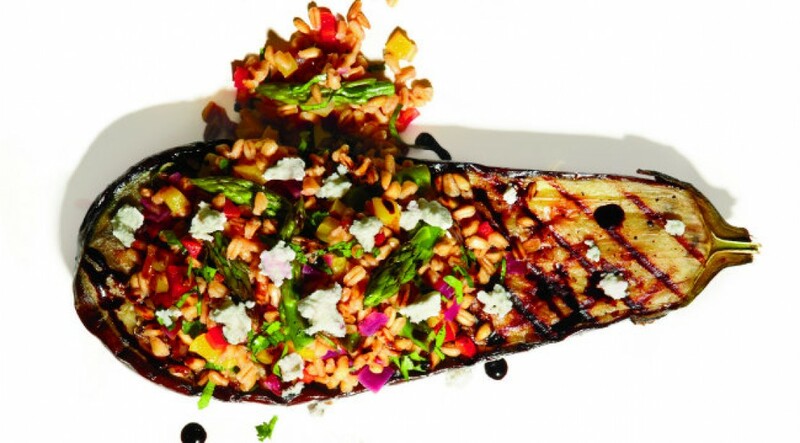 Place grilled eggplant on the center of the plate with farro mixture on top. Garnish with balsamic reduction around plate and top with goat cheese.